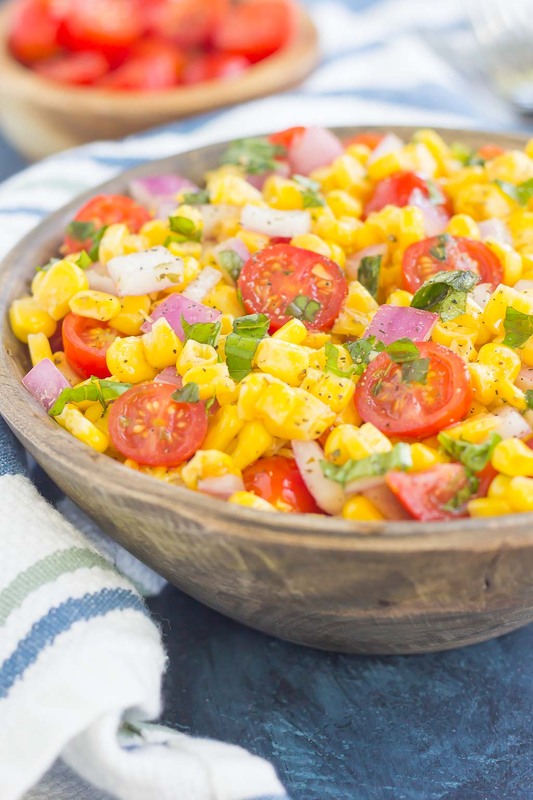 With fresh corn cut straight from the cob, cherry tomatoes, spices, and a light dressing, this Corn and Tomato Salad is perfect for a summer lunch or dinner! Summer just screams salad season, doesn’t it? Don’t get me wrong, salads are wonderful anytime of the year, but they just seem to taste better in the summer. Fresh produce, bright pops of color, and light dressings are the perfect lunch (or dinner) for me. And now that I have become a regular at my town’s farmer’s market, I’ll use any excuse I can find to stock up on some delicious fruits and veggies. While I was strolling down the aisles of the farmer’s market last Friday, carefully inspecting my produce, a family across the way caught my attention. A mother, who seemed a bit frazzled, was trying to usher her two young daughters around a table of fresh berries that was placed in one of the aisles. While her back was turned, the older daughter, probably around five years old, quietly reached over and grabbed two raspberries from an open container. She popped one into her mouth, carefully savoring the sweet taste and relishing in her secret victory. Her younger sister caught wind of this and immediately shouted, “I want one! I want one!” As the girls dashed around the table, with the mother following behind, I couldn’t help but chuckle. After stocking up on several ears of fresh corn, I knew I wanted to make a salad, just like the mother with her small children. Fresh veggies were a must, and the flavor had to be light. Thus, I created this Corn and Tomato Salad! With fresh corn cut straight from the cob, cherry tomatoes, herbs, and a light dressing, this salad is perfect for a summer lunch. Aside from the fresh veggies, the dressing is my favorite part! I used a mixture of white balsamic vinegar and olive oil. That’s it! 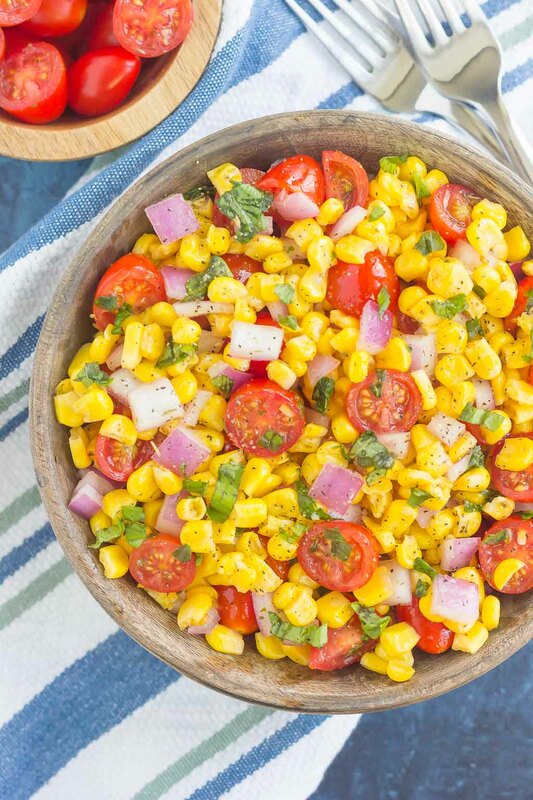 It gives this Corn and Tomato Salad a light flavor that pairs perfectly with the fresh herbs. And like all of my recipes, this salad is very easy to prepare. The only prep work needed is to boil the corn, cut it off the cob, chops up your veggies, and mix. And voila! A perfectly light and healthy salad, perfect for a hot summer day, or a warm summer evening. The fresh vegetables and herbs definitely make this salad out-of-this-world good. If you love basil and oregano, than you will simply adore this salad! And if you haven’t tried white balsamic vinegar yet, it’s a necessity that you do so right away. It will be life-changing, trust me! 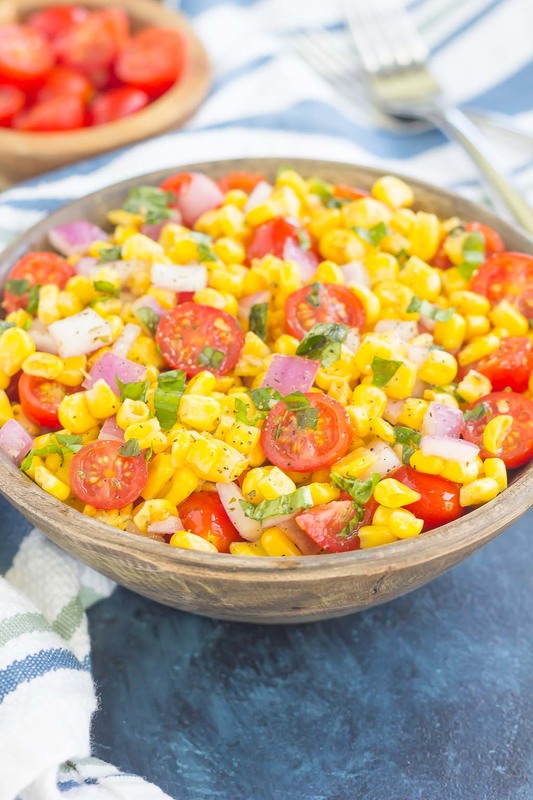 So the next time you’re looking for a new salad that’s loaded with fresh produce, give this Corn and Tomato Salad a try. I promise you’ll love it just as much as me! Place corn cobs into a large pot of boiling water and boil for 7 minutes. Shock corn by submerging into a large bowl of water (I do this so that the corn stops cooking and still has a slight crunch to it). Remove corn from water and set aside to cool. 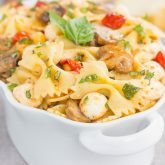 In a medium bowl, combine tomatoes, onion, basil and oregano. Lightly toss to mix together. Cut corn off the cobs and toss in salad mixture. Pour olive oil and white balsamic vinegar over salad and toss to coat. Salad will keep, covered, in refridgerator for about five days. This salad looks so pretty in the way only a red and yellow salad look pretty. And sometimes, I just need a break from the traditional "green" salad, makes me go a little bleh after a while. Love the corn in the salad! Great tip from that mom. Never have been a corn and tomato salad before, but like you said, corn is abundant at Farmer's markets here too, Can't wait to try! Have a great weekend!! Thanks so much, Laura! I'm the same way too, sometimes I just need to switch up the green salads for something else. This corn salad is so fresh and delicious, I hope you like it if you try it! Yum! My mom is a huge corn fan and has been begging me to make more salads, so I'll have to give this a go! Sounds like you found a perfect salad for your mom, Medha! I hope she like it if you make it! Summer definitely brings on a different type of food and eating, Bri! This salad is perfect for it! Light and healthy, but could be jazzed up with some chicken, too. The colors in this salad are gorgeous! Perfect for summer! Thanks so much for the compliments, Kelly! I agree, this salad is great for the summer. So easy to throw together, too! Oh, that poor mother. I have been there so many times! That's why trips to the market by myself are now considered vacations! You are completely right. This is salad season! And this one is fantastic. I love the white balsamic in the dressing! So light and inventive! Happy weekend, Gayle! This salad looks really light and flavorful! I've made a similar salad that includes fresh mozzarella, but doesn't look like you need the mozzarella at all! Delicious! Thanks, Sarah! The fresh herbs really give this salad a nice flavor. That's a great idea to throw in some mozzarella, I will have to try that next time! Fresh produce is one of my favorite things about summer! 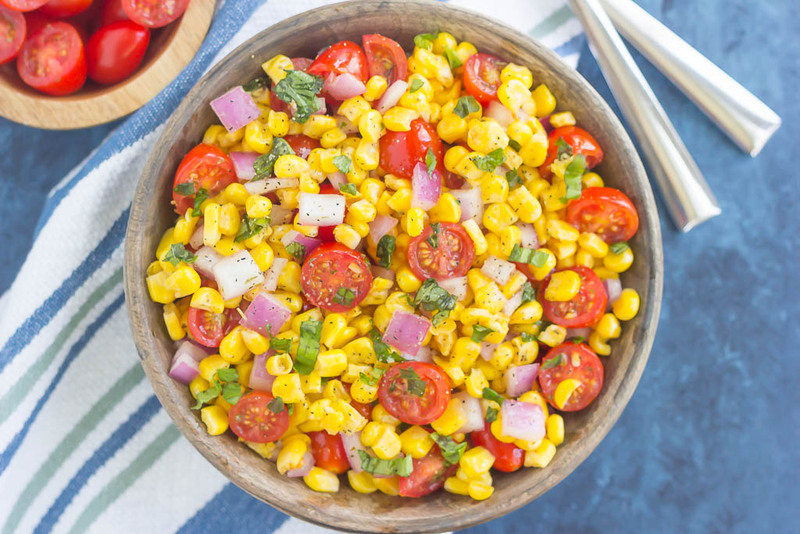 This corn and tomato salad looks so bright and tasty! Thanks, Meghan! I absolutely love going to my town's farmer's market...so much to choose from, and it's so much cheaper than regular grocery stores! I love a corn salad! Something about the sweet crunchiness is so satisfying. Love the bright white balsamic dressing too. The colours really pop! Eating with my eyes first always makes for the tastiest meal. Mmmmmm. I'm the same way, Allison! I love when corn is crispy, especially in this salad. And the dressing gives it such a light and flavorful touch. 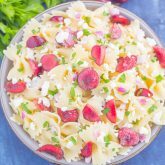 What a great summer salad! Very appealing, and refreshing. I like that you also used a non-complicated dressing. Thanks so much, Lori! The fresh veggies and herbs give it a nice pop of color. The dressing is simply amazing, my new favorite! Thanks for stopping by! This sounds like a pretty perfect little easy summer salad, Gayle. I haven't tried white balsamic yet but I'm clearly missing out! I love that you got the inspiration for this salad from a frazzled mother at the market, too. Well, why not? Thanks, Helen! It is so easy to throw together. Boiling the corn is the hardest part! :) You definitely should try white balsamic soon, I think you will love it! This salad is right up my lane! I love the combination of fruits and veggies and it's so good for summer! I think my favourite part is the white balsamic vinegar! I love the white balsamic, too! Gives the salad a light flavor, and doesn't discolor it like regular balsamic would. Definitely a fresh salad full of veggies! I agree, Kathi! I love summer salads that utilize fresh fruits and veggies. Thanks for the compliments! If you try this out, please let me know what you thought of it! What a wonderful salad, love fresh corn. We are supposed to be able to buy corn here this next week at the farmers markets for the first time this year. Can't wait!!! Pinning! Thanks so much for the kind words and pin, Cheri! I absolutely love buying corn from the farmer's market...so fresh and delicious! If you try this salad, please let me know how you liked it! I am totally with you, white balsamic vinegar is life changing! ha! I prefer it to the regular kind for sure! And I am totally in love with this salad, we have loads of sweet corn we need to use. This will be perfect! Yes! Isn't white balsamic the best, Annie! Gives food such a light taste, and I love that it doesn't change the color like regular balsamic does. Sounds like this salad would be perfect for you! Have a great weekend! What a beautiful summer salad! I could eat corn and tomatoes all summer long! Thanks so much, Christin! I'm the same way, I feel that corn and tomatoes definitely taste better in the summer, and especially in this salad! This dish looks so bright and fresh! I can't get enough of fresh veggies this time of year. Thanks, Danielle! Fresh veggies are my favorite in the summer. I try to find any way to sneak them into salads and other dishes! Have a great weekend! Looks delicious, Gayle! Can you believe I've never had white balsamic vinegar before? I need to get my hands on some ASAP, it sounds amazing! Thanks so much, Denise! Oh you must try white balsamic vinegar soon! It's so delicious, lighter than regular, and won't discolor your salads. Have a great weekend! another awesome idea gayle! this is just perfect for summer.. love it! Thanks so much, Thalia! This salad definitely reminds me of summer, and is so delicious because of the fresh veggies! I'm so glad you enjoy salads in the summer, too, Amber! Aren't corn based salads delicious? Such a nice change from green ones. 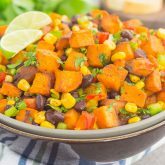 That is a wonderful idea to add in some black beans, I will definitely try that next time! And yes, this is a wonderful salad to bring to barbecues! What an adorable anecdote about the mother and her daughters! I love this summer fresh salad inspired by them! I love fresh corn in the summer and I can't wait to try it in a salad! Yum! It was so cute watching the mother and daughters interact with each other, Lindsey! The mom definitely got me thinking about corn! :) This is one of my favorite salads, so light and refreshing. I am so with you on the salads this summer! My husband always says he needs more than a salad for dinner, but if it were up to me I could eat them for lunch and dinner everyday! 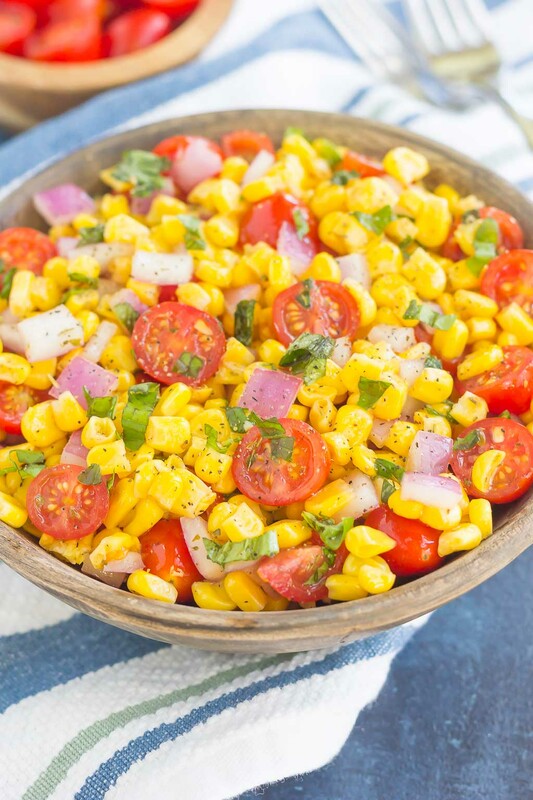 I especially love salads that have corn and tomato, two of my summer favorites! My husband is the same way! He will never order just a salad for lunch or dinner, but will eat it as a side. But I could eat salads all day, every day...especially this corn and tomato one, it's delicious! How fantastic is corn?! Its not at all salad season, but .... turn the heat up, throw on a couple extra layers and this salad would be a fab side to some grilled meat. Soak up some sunshine for me! The minus degrees are a total drag. That's a wonderful idea to add some grilled meat to this salad, Anna! Hopefully the warm weather will embrace your area soon! And I definitely know how negative temperatures feel. Stay warm, Anna! Oh this looks so fresh and lovely! Love all the colors to it and I bet it tastes simply delicious! Thanks, Julie! This salad was amazing! The corn and tomatoes really complimented each other, especially with the white balsamic dressing! 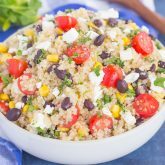 This looks like a totally perfect summer salad! :) Super simple, too. Thanks so much, Allie! Definitely an easy and delicious salad to whip up. A favorite on my list! Thanks for stopping by! I love how fresh and healthy this is! :) And that color! I love it! Thanks, Jocelyn! I love the pops of color too, and the taste is delicious! What a gorgeous salad, Gayle! So perfect for summer! Love the colours and how fresh and bright it is! This one would make a lovely addition to any backyard bbq :) Pinning! Happy Monday, my friend! This is SUCH a pretty corn salad, Gayle! I don't make corn salads that often but I totally should after seeing this beauty! LOVE all that color! Thanks, Sarah! I love the color, too! Love that story, which reminds me that I didn't go to the Farmer's Market last Friday :) This salad looks perfect! Can't wait to try it! Haha! I can totally relate to those sneaky little sisters! This salad is GORGEOUS Gayle -- I can't wait for fresh local corn to reach us here! I'm sure you can! :) Thanks, Ashley! Summer definitely screams for salads, and for ALL THE CORN!! This salad has my name written ALL over it, Gayle! I'm so glad you decided to re-shoot and re-share this, because I absolutely can't wait to devour a big 'ole bowl of this! Pinned! Cheers, friend! Thanks for the pin and sweet comment, Cheyanne! I love the new photos Gayle and I live for salads like this in the summer! This is something that I could seriously eat every day! I love that you're resurrecting these archived recipes! Nothing like a good corn salad in summer! Corn salads are the best! Summer salads are just the best. I'm obsessed with corn and tomatoes... especially since I have my own garden tomatoes now. And, the local corn has been delicious.... which means I need to combine the two and make this salad. So pretty, Gayle! Thank you, Keri! Corn and tomatoes make the best combo! This salad has so many amazing colors :) It's perfect for the summer. I love using white balsamic and olive oil - I'm putting this pretty summer salad on the family meal plan this week. Thanks!